Oh, how I love snow ... I am enjoying this beautiful snow fall, the large flake kind of snow fall! I thought I would spare you a picture of the barn and show you the tree house, aka Fort Gunter, and our famous crazy swing! The snow flakes were huge and oh so sticky ... perfect for snow balls! As you can see, we had lost quite a bit of snow from our last snow fall. I'm probably a minority right now ... many are eager for Spring to be in full swing ... but I love a good snow fall! It is so beautiful, so peaceful! Now that I've cut up all of my 1930's scraps for the Flying Geese quilt, it's now time to get serious and pull out yardage and fat quarters from the stash! 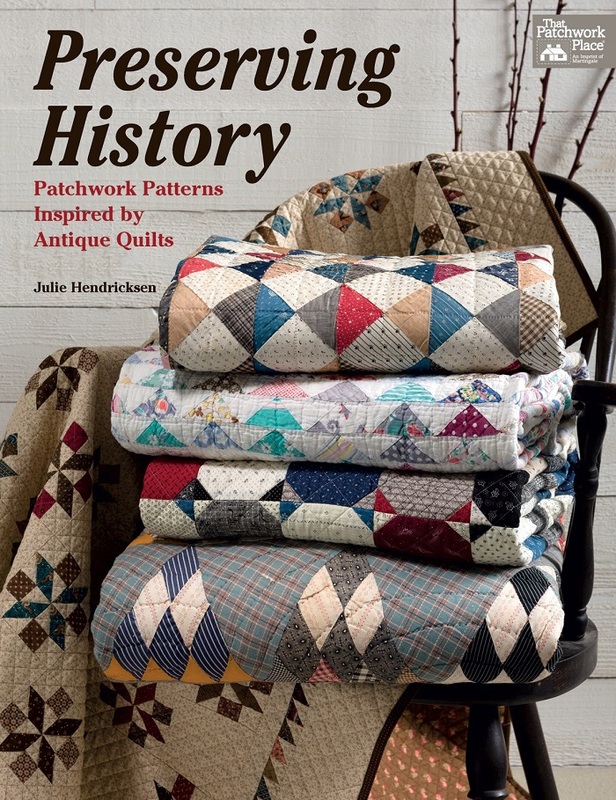 I started a new project from a stunning book by Julie Hendricksen Preserving History - Patchwork patterns inspired by antique quilts. I'm cutting up 5,070 pieces to make the quilt Flying Geese, the one pictured second from the top. I'll be using my 1930 scraps and, in keeping with the period, muslin as a background. This is therapeutic for me .... so many emotions going through me at the moment .... I'm not sure how to handle them all .... So, I quilt away, cutting and piecing, as I work through the overwhelming emotions. Quilting allows me to feel a sense of control ... there is so much going on in this world. 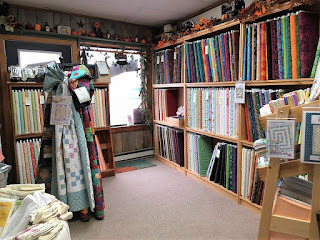 I am well aware that control is an illusion, but nonetheless, quilting provides me with the feeling of being able to piece everything as it should be ... in my world anyway. 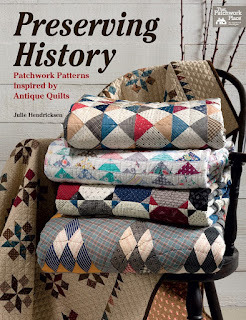 Quilting also connects me to our fore-mothers, to my history ... herstory. As I cut up my scraps, I feel a sense of kinship with women and their contributions to history. Everyone needs a quilt to cover themselves with. A quilt is pure love and nothing less. When you sleep under a quilt made by a quilter, you can feel the energy of love comforting you. Someone cares enough about you to piece love and comfort for you! The world presently needs more love and compassion .... it needs more quilts! It is absolutely gorgeous out there! Mother Nature has grounded to a halt all of our busyness! As you can imagine, there has been a lot of shoveling in the last 24 hours ... I really don't mind ... it's so peaceful out there! Here is the front door steps ... this, after I shoveled last night at 8:30 p.m.
Last night, I made sure that both my bird feeders were filled and that there was clean water in the bird bath. Check this out! Lot of birds continue to stop by ... more than usual .... I'm enjoying watching them from the warmth of my home. Thanks for stopping by my little corner in cyber space! Cheers! Isn't it beautiful? We presently have over 6 inches of snow (16 centimeters) and it is still going strong! Gosh, I love this kind of weather ... safe and warm .... I spent 20 minutes admiring the birds coming to my feeder. I imagine they are getting re-fueled for the long night! Stay safe and warm everyone! Cheers! As you all know, I absolutely love Fibre Junction. 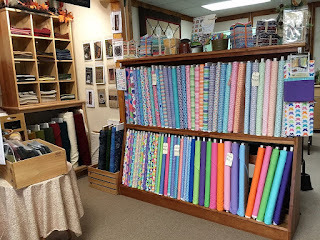 I have poured my heart and soul into this quilt shoppe, making it what it is today. 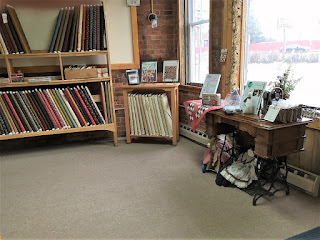 I enjoy being at Fibre, surrounded by gorgeous fabrics and creating samples to not only grace the shoppe, but to inspire my customers to take their quilting to the next level. However, I always knew deep within myself that Fibre Junction would not be a forever thing. My heart is now being pulled in a new and different direction. It is time for me to pass the Fibre Junction baton to that special someone who will be the next owner of this delightful quilt shoppe, someone who will continue to make Fibre Junction an inspirational and creative place. Will that be you? If you are looking to own a quaint and established quilt shoppe, then Fibre Junction is for you. This is an amazing opportunity for someone who is passionate about the trade. In the meantime, it is business as usual. 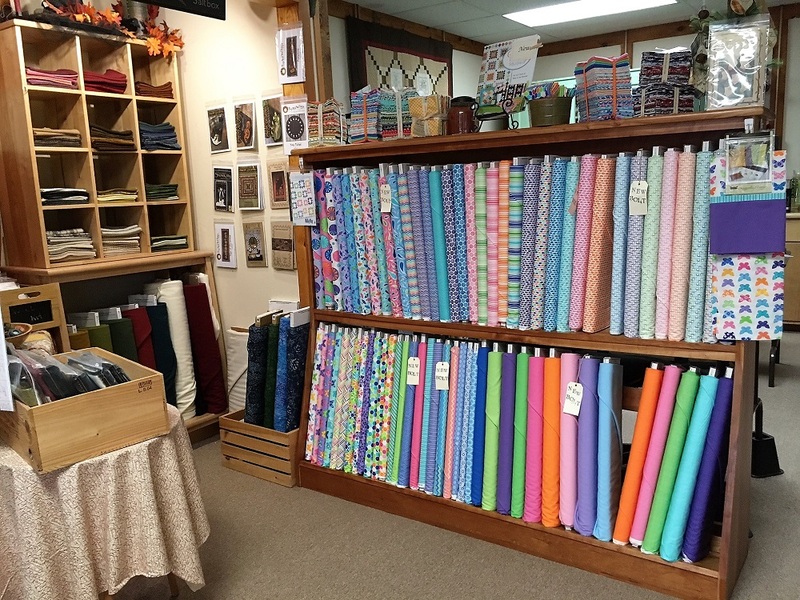 Stop by Fibre Junction! 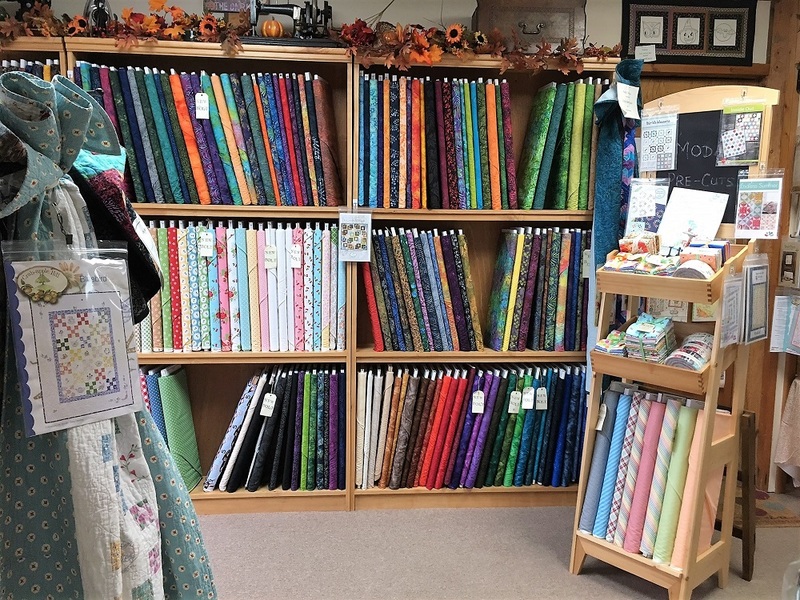 ... to make your next quilting project. and get in touch with your creative self! I know I do .... every time I walk into Fibre Junction! I love this shoppe! Thanks for stopping by and being a part of my cyber adventures! In honour of Dr. Seuss' birthday ....! I'm still in my "clear projects out" mode and decided it was time to finish a quilt that my little Pumpkin started approximately six (6) years ago - Dr. Seuss The Lorax quilt! 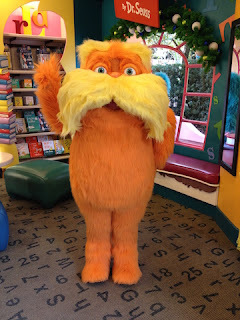 I love the Lorax! I met him on our Universal Vacation back in 2015. Slowly, after a couple of years, the quilt was brought to the stage of blocks completely pieced. It was just a question of putting it all together to create a quilt top. I did fussy cut the horizontal sashing, as it was a tad advance for a 13 year old! There the blocks laid, in my closet, awaiting Pumpkin to pick the project back up again. After a few years of just gathering dust, I decided that it was time for me to take matters into my own hands and get the quilt done. It has since been machine quilted, washed and, I even had enough of The Lorax backing fabric to make a pillow case, all in time for her surprised visit last weekend. My goal was to have it done by March 10! Ah! Beat that goal! Yea! Oh, she was surprised and so delighted! She actually brought it back to college with her! Can you see my big grin? The actual name of the quilt is called The Need for Theeds, designed by Rachel Griffith for Robert Kaufman It is a free pattern and you can obtain a copy of the pattern here. Thanks for stopping by my little corner in cyber space! Catch you later! Cheers!